Welcome to this site. Nearly five hundred years ago European collectors arranged their pieces in cabinets of curiosities (Wunderkabinette) in an attempt to display their rare pieces. As collections grew, the more ambitious set aside rooms called Wunderkammern (Rooms of Wonder) for visitors to come and view their collections. These were the first museums. 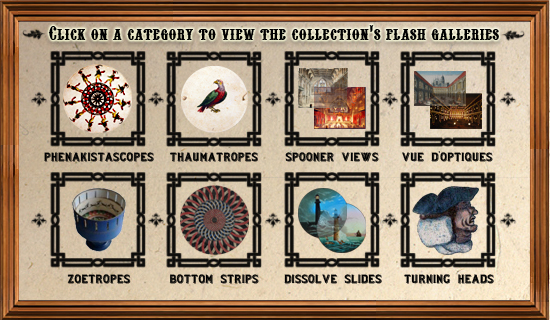 Today, the internet allows the possibility of visiting museums without leaving one’s home, and similarly, the possibility of constructing a virtual Wunderkabinett -- my cabinet of curiosities. What sort of curiosities will you find? I have been collecting for more than thirty years, and my collecting wanders around the theme of visual entertainment, and almost all of the collection dates from before 1900. Over time you will find magic lanterns, peepshows, shadows, transparencies, thaumatropes, phenakistascopes and a variety of other optical toys. You may find things that seem odd in this collection, however, always remember that collecting is a very personal thing and these items may stretch the boundaries of visual entertainment but nevertheless have found a place in my collection. I have wanted for a long time to catalogue my collection and create a website to display and share parts of it, but never could find the time. Life sometimes ironically offers in unexpected as well as disguised forms opportunities to get to things you have postponed. This, for me, has been a time of such opportunity. The internet has created lots of opportunities for people to learn more of the history of these devices, and I offer links to some of these sites. My site will concentrate instead on the presentation and cataloguing of these wondrous devices and their representation in a variety of forms from scientific tomes to representations in the popular culture of the period. Take a look. Perhaps you will see things you have not previously seen, learn something new. If you have more information on an item you see, sharing it will be a gift to me. Enjoy your visit!